I was at the grocery store the other day and came upon a boxed mix for beer bread. Intrigued by this interesting mix, I decided to head home and research some different recipes; I figured I would save a few dollars and (hopefully) yield a better result by making it from scratch. After sifting through several different variations on this hearty bread, I finally found a recipe that suited my (rather picky) taste. With a wonderful crunch on the outside, and a slightly sweet and incredibly moist center, this bread is the perfect companion to any of your favorite soups, or simply as a delicious treat straight out of the oven. Enjoy! What is your favorite way to enjoy fresh bread? Let me know below! I used a 12 oz can of bud light for my recipe, but I’m sure any beer that you have on hand will be perfect. I’m excited to try this recipe with a Guinness! If you prefer a savory bread, reduce the sugar to just a teaspoon or two. You can easily adjust the sweetness according to your taste. This bread yields a very crusty loaf, if you prefer a softer crust, mix the butter into the batter, rather than brushing it on top of the loaf. If you aren’t weighing your flour, be sure that you sift your flour BEFORE measuring, otherwise you will likely get a dense loaf. *If you’re not weighing the flour, SIFT before measuring, otherwise you will get a very dense loaf. Bake 50 minutes. Remove loaf from oven and brush melted butter on top of crust. Return bread to oven for an additional 5-10 minutes, or until loaf is nicely golden. This may vary slightly depending on the heat of your oven. Remove bread from oven and turn out from pan onto a wire cooling rack. That looks super easy. I keep promising my husband I'll make beer bread but he always ends up drinking the beer before I get a chance. I like to make simple bâtards- kind of like a baguette but not as pretty or as long to work with. Interesting, I've never heard of batards before…I will have to look into that! 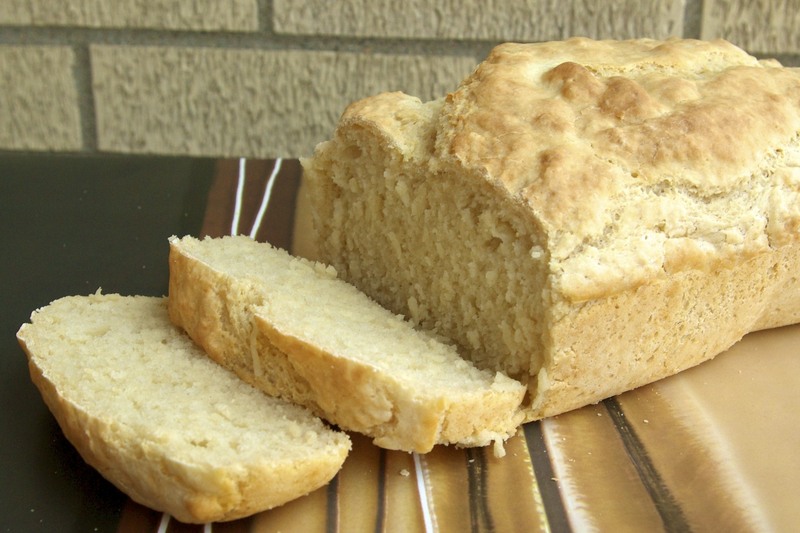 And yes, the beer bread is ridiculously easy, that's for sure! Pete just made something similar with whole wheat flour and it was amazing! !